A distinction list, which allotted its space to companies such as Google, Facebook, Kakao, Twitter, Rakuten, Salesforce.com, Xiaomi and YouTube, has inducted 4i Solutions as one of the winner for the year 2015. 4i , a certified Oracle Platinum Partner Company, founded in 2008, has now grown into a multimillion dollar company within a span of seven years and has its presence across the globe. In the last seven years, the company has grown at over 70% CAGR, which also helped in finding its place at Red Herring Asia’s Top 100 list for differentiating itself as a cutting-edge company and positioning itself to grow at an explosive rate. 4i Solutions provides various services ranging from enterprise applications (on-premise & cloud), and business intelligence solutions. Enterprise Application on-premise offering includes Oracle E-Business Suite, Oracle Fusion Applications, Oracle Primavera, Oracle Business Intelligence, Oracle Hyperion and SaaS offerings includes Fusion Applications, Taleo, BI. “The last one year for 4i Solutions has been a wonderful journey so far. From making it into Deloitte Fast 500, to Red Herring Top 100 Asia, it’s certainly been a great success story for us. We have also spread our wings by opening new offices in Dubai and Singapore, significantly expanding the company’s presence in APAC and MEA,” said Saravanan Murugesan, Managing Director, 4i Solutions. “4i Solutions embodies the vision, drive and innovation that define a successful entrepreneurial venture. 4i Solutions should be proud of its accomplishment, as the competition was as strong as ever,” said Alex Vieux, publisher and CEO of Red Herring. 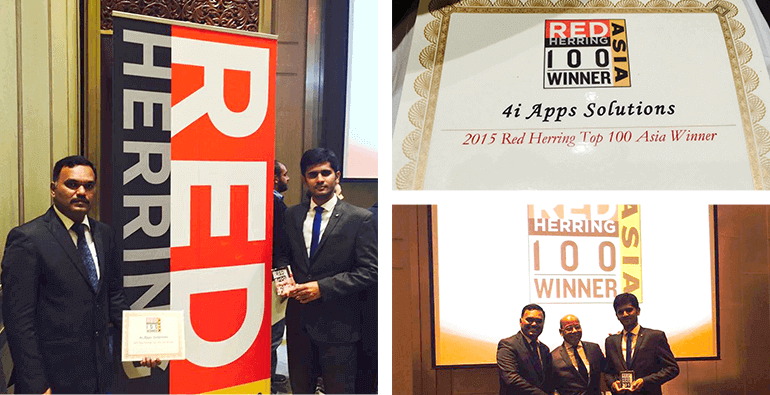 Red Herring is a global media company, which unites the world’s best high technology innovators, venture investors and business decision makers in a variety of forums, Red Herring’s Top 100 Asia list has become a mark of distinction for identifying promising new companies and entrepreneurs. These winners are chosen based on financial performance, technology innovation, management quality, strategy, and market penetration. Fulfilling all the criteria for excellence, 4i Solutions stood tall in the pursuit of success by disrupting its industry and gaining substantive traction. For more information, visit www.4iapps.com.